From the moment you drive up the long drive of Enchanted Lake, until you head home, you will experience a one of a kind vacation adventure. The warm feel of hardwood floors, rocking porch swings, the beauty and whimsy of the enchanted 3 acre Lake, the lodge, and the 21 acres will delight you. Driving up to the lodge, the front porch with porch swing welcomes you. Entering your eye will be caught by the lake view from the great room, as well as the floor-to-cathedral ceiling stone gas fireplace, that creates a warm country atmosphere. The living room will comfortably seat you and your guests as you enjoy the large screen TV. The dining area seats 10! Plus there are six seats at the kitchen bar for those who like to stick with the cook. In the fully equipped kitchen you will find everything you need to prepare a dinner for family or friends. Right outside is also the stone charcoal or wood grill for those steaks or burgers. From the great room, step outside to the wrap around porch. The three porch swings provide plenty of sheltered seating with a lake view. Enjoy the evening stars, morning bird calls, and fresh, crisp breezes over the lake from this porch. Back inside, explore the master Green Bedroom on the main floor that features a king sized bed, walk-in closet, and 32" flat screen TV. There are also French doors out to a private corner of the porch equipped with two porch rockers. The adjoining Bath gives you the luxury of a 2 sink vanity and separate bath area. The Red Bedroom across the hall also features a king bed, ample closet, and flat screen TV. Upstairs you will first find the loft area. Next, explore the Blue Bedroom, with a king bed, flat screen TV, and a view of the lake. Next door is the Fawn Bedroom, with a king bed, and flat screen TV. This floor has a full bath, with separate vanity and bath areas. Now, for a surprise, travel back down stairs and then down to the lower level. A local artist decorated the lower level and the new owners left the art intact! Walking downstairs you will first notice the art in the stairwell. Next the 11 foot painted bar will draw your eye, with its wet sink, refrigerator for your drinks and snacks, as well as a microwave. There is a flat screen TV to be viewed either from the bar or as you play pool, foosball or air hockey. On the other side of the room is a Futon, and a swing to view the TV in this area or to watch the gas fireplace, or view the lake. There is also a half bath with a large vanity on this level. Right outside is the hot tub, and homemade kid or big kid swings. Farther out into the yard leading to the lake and trails is the fire pit. The lake provides a great fishing opportunity! 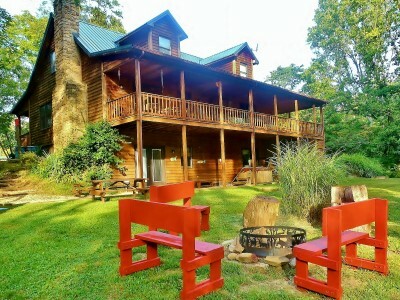 If you are searching for an awesome vacation home, Enchanted Lake is it! This is your private resort with so many amenities and so much to enjoy, you will long to return, year after year, bringing family and new friends.